Today will feature more wet weather with the chance for frozen precip away from the immediate coast. Rain/frozen precip will be mainly light to moderate but could become heavy later this morning. An additional inch of rain is expected. An overview of today’s weather. 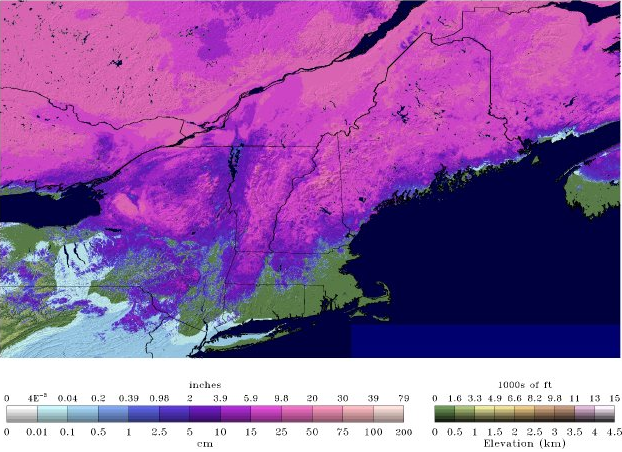 Anywhere in purple is where you have to watch for icy conditions thorough not all areas there will have icy conditions. Winds will also be a factor today gusting out of the North at over 20 mph at times. This will draw in colder air leading to frozen precip. Tomorrow features clearing skies and winds out of the WNW at 10-15 mph. Temps will be a bit warmer though still not all that warm. Another system moves though Wednesday with little fanfare, just some clouds and the slight chance for a shower. Temps will rise into the 40’s. Sun and 40’s rule Thursday. Things cloud up Friday in advance of our next storm Saturday into Sunday. Today will feature heavy rain/freezing rain/sleet/snow in the morning tapering off this afternoon. Don’t get too excited though, mother nature comes back to bite with more precip this evening through tomorrow night. The forecast looks good as I sample data from around the region this morning. It is thumping snow in the mountains and in the northern part of the state. 5″ has been reported at Sugarloaf Mountain for those lucky enough to be on the slopes today. Cold air will drain south today at the surface which could cause some to go over to freezing rain. This freezing rain/rain line will creep southward as the day goes on. 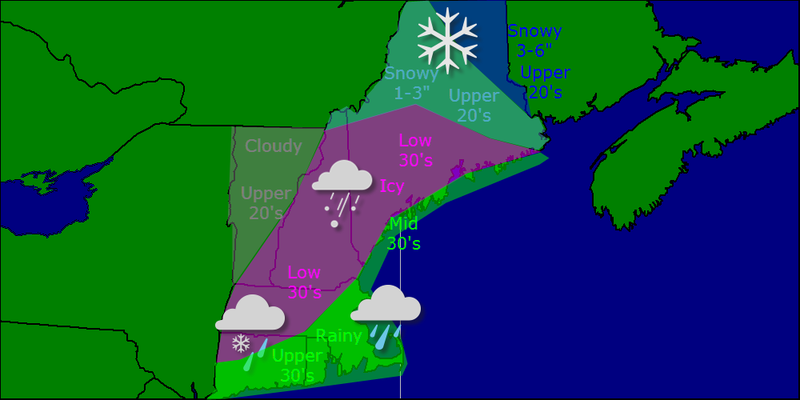 When precip redevelops tonight, the freezing rain will make it all the way to the coast. Tomorrow morning, the late march sun will warm things up despite its lack of visual appearance resulting in the coast and inland areas going back to plain rain. The mountains will continue to stay all snow. Precip continues through the day on Monday ending as snow for all Monday night. A coating is possible at best for the coast and adjacent inland areas. Precip comes to an end Tuesday morning between 3 and 6. We have a lovely week ahead of us with mainly sunny conditions and warm temps in the 40’s. Tuesday will feature the passage of a front which will bring some extra clouds and the chance for a shower. I know nobody wants to hear this, but another coastal storm looks to affect the region next weekend with more rain and mountain snow. As they say, April showers bring May flowers. Today will feature mostly cloudy skies and warm temps with highs rising well into the 40’s. Any rain from our approaching system should hold off until late afternoon for southwest areas and for everyone else, any precip arrives after dark. Tonight, rain moves in and becomes steadier and heavier as our storm begins to develop. Expect light NE winds as this storm will not be very strong nor will it be intensifying all that fast. Tomorrow features heavy rain and breezy conditions. Expect highs in the low 40’s. Rain should become lighter as the afternoon progresses but as I will explain below, precip could hang around until midweek. Monday through Wednesday will feature light to moderate rain/freezing rain/snow even at the coast. I expect Sunday night into Monday morning to be the worst in terms of icy conditions. Late week we clear out and warm up into the upper 40’s under sunny skies. More rain/freezing rain/snow is possible next weekend but there are still a lot of details to be worked out. As spring arrives and warm and cold air battle it out over the US, we often get low pressure systems that are ‘cut off’ from the rest of the jet stream. They will meander around extremely slowly (anyone could out-jog them fairly easily) while bringing rainy/snowy weather to whichever area they happen to be in. This is the kind of setup we will be stuck with over the next 5 days. The low will stall off Cape Cod and sit there with no interest in moving an inch. As a result, prolonged periods of rain and freezing rain are expected. It looks like the mountains will be too far away to get any more snow but that is also a possibility just as no precip is. Expect QPF (Quantitative precipitation forecast which is the amount of liquid forecast to fall from the sky. Usually 1″ of QPF is 12″ of snow) amounts around an inch for the mountains and between 2 and 3 inches at the coast. This will fall starting this afternoon into tonight and last until Tuesday or Wednesday. I think that the majority of that will fall as rain for the coast but starting Sunday evening, a flip to freezing rain is likely. I expect freezing rain amounts to be between 1/4″ and 1/3″. I will go into more detail below. Zone 1: Heavy snow. Snowfall amounts between 12 and 18″ with 24″ amounts possible. Expect snow to start tonight and end tomorrow night. Winds out of the NE at 10-15 mph. Temps in the low 30’s. Zone 2: Heavy snow with a little rain possible. Snowfall amounts between 6 and 12″ Expect snow to start tonight and end Monday. Winds out of the NE at 10-15 mph. Temps in the low to mid 30’s. Zone 3: Rain/freezing rain with a little snow. 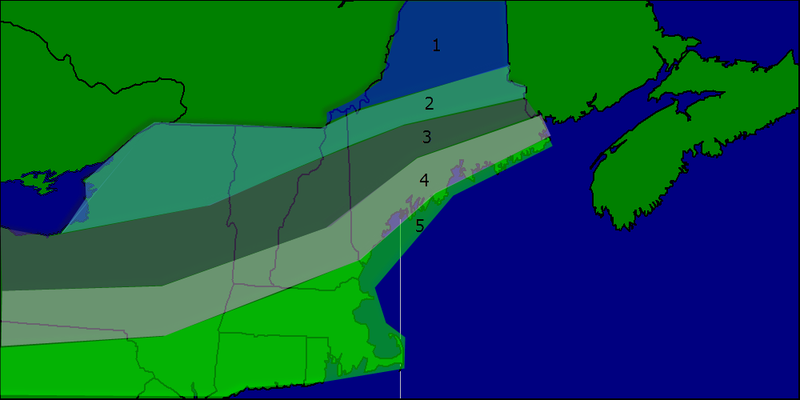 Snowfall amounts between 2 and 6″. Freezing rain amounts between 1/4 and 1/3″ Expect snow to start tonight and change to snow tomorrow before turning back to snow Monday. Precip ends Monday or Tuesday. Temps in the low to mid 30’s. Zone 4: Rain with some freezing rain. Freezing rain amounts between 1/4 and 1/3″ Expect rain to start tonight and possibly extend through Wednesday. Rain amounts 2-3″. Temps in the 40’s tomorrow falling into the 30’s tomorrow night through Tuesday/Wednesday. Zone 5: Rain. Rain amounts 1-3″ higher amounts in the NE sections. Along the Maine coast, freezing rain is possible Monday through Tuesday/Wednesday. Precip ends Tuesday/Wednesday. I am concerned about flooding because there is a heck of a lot of water locked up in the snow in the foothills and mountains. In areas forecast to get 2-3″ of rain, up to 10″ is locked away in the snow. Not all 10″ will melt but there are sure to be problems with this kind of a setup. This map shows how much water there is in the snow. Click to enlarge. As hard as it is to believe, there are still ice jams on the rivers left over from the January thaw. When new water flow into rivers already ice-jammed, minor flooding is likely. Most of the area is under a flood watch from the NWS with the exception of far northern areas which are under a winter storm watch. After this storm, warm and mild conditions are locked in place as we sit under high pressure. However, all good thing must come to an end as wet weather threatens for next weekend. Today will feature periods of rain and snow depending on your location. Coastal areas will start as rain and snow but go over to all rain around 11. Inland areas start as all snow and go over to freezing rain around noon and rain around 1. A trace of ice is possible. For the foothills, Expect mostly snow with a period of freezing rain. Snow could accumulate 2-4″ along with .1″ of ice. For the mountains, all snow is expected with 3-6″ of accumulation. All precip moves out tonight leaving mostly cloudy skies for Saturday morning. Saturday, things cloud up again ahead of a much more significant storm. Precip with this one should start Saturday around 3. Precip type is where things get very tricky with this storm. 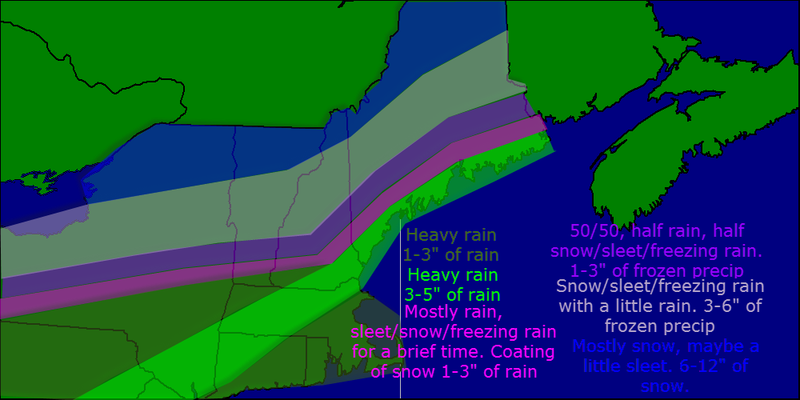 each model run has varied wildly between heavy rain, snow storm, or ice storm. Right now, I expect heavy rain along the coast with a myriad of p-types as you head inland. Above is my best guess of what will fall and how much this weekend. I will update this tomorrow. Flooding could become a big issue at the coast where 3-5″ of rain is expected. Keep in mind, ice jams are still in place from January’s thaw. Up north, more snow will be added to the pack and when it all comes flooding down, it will not be pretty. Thankfully, only more snow is in the 7 day up there. Ski resorts will be very happy. More rain/snow early next week and another potential for a significant rain/snow storm arrives later next week. Expect light precip Tuesday in the form of rain at the coast and snow inland. Heavy precip makes a return Thursday into Friday next week. Today will feature sunny skies, cool temps, and a lot less wind. Winds gusted over 50 mph at Portland and Augusta. One buoy in the Gulf of Maine gusted to 115 mph on several occasions. 115 mph is major hurricane strength. Highs today will reach the mid 30’s as winter continues for one more day. Tomorrow, showers are likely mainly in the afternoon hours. Temps could hit 50 under cloudy skies. Winds could become breezy out of the south. Saturday is the best day out of the weekend with just a chance for a passing shower. Greatest chance before 8 am and after 6 pm. Temps will be in the low 40’s. Sunday is when things get interesting. Models are handling a developing low pressure are very poorly as it intensifies off the coast. There are 3 probable scenarios that we will have to watch with this one. Monday looks to be pleasant with temps in the mid to upper 40’s and full sun. Next week features more rain Wednesday and Thursday with less than pleasant temps. Today will feature very windy conditions as an extremely intense low moves to our east. Winds could gust to hurricane force over Downeast Maine while everyone else sees tropical storm force winds. Winds will decrease over inland areas. Highs today will not get above freezing for the third day in a row. Temps will only make it to about 30 under cloudy skies. As for snow, expect any steady snow to be to our east with showers and squalls here in Southern and Central Maine. A dusting is possible. Tomorrow, we clear out and warm above freezing sunder sunny skies with highs reaching about 35. Winds will be calming down as well as the storm heads east and weakens. We have a warm and rainy weekend ahead with several storms moving along a slow-moving front. One will arrive Friday with heavy rain and fog. Showers are expected Saturday with another storm Saturday night into Sunday. We will have to watch out for flooding as almost a foot of water is locked up in the snow pack up north and some of that could suddenly flow into rivers with ice jams left over from the January thaw. How much water is in the snow or Snow Water Equivalent. More rain is in the forecast for next week. Temps could hit 50 for the first time this season on Monday. Today will feature continued cold with temps again struggling to hit 32. Clouds will increase as the day goes on as a monster ocean storm approaches from the south. Tomorrow, light snow and extremely high winds impact the area on the fringes of a monster storm. We really dodged a bullet as Atlantic Canada will pick up 2-3 FEET with even higher winds. I want to take some time to break down the wind threat as it is not something to be ignored. Winds along coastal Maine will gust over 50 mph. This alone would be worrisome as trees are still brittle from our ice storms this winter. However, our road crews have diligently spread mind boggling amounts of salt and sand on our roads that lies there right now. 50 mph winds will cause this to blow around quite a bit which would really hurt if you happened to get hit. The NWS has outlined the likely possibility of a High Wind Warning for coastal areas due to this. As for snow, a wind-blown coating to 2″ is likely for Brunswick, Portland, and Augusta. 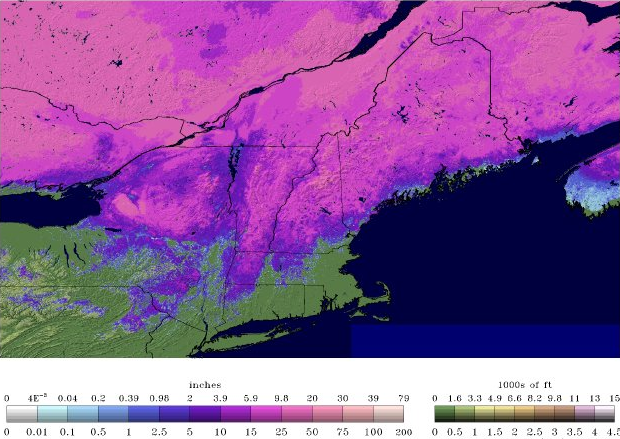 Midcoast sees 2-6″ while Downeast Maine sees over a foot. We really dodged a bullet here in Southern Maine as this could have been really bad. Spring arrives Friday, Saturday, and Sunday with heavy, flooding rains and temps in the 40’s. Monday features our first shot at 50 this spring. Enjoy!